A NASA scientist-turned renowned golf coach was one of the major draws at the ‘biggest ever’ European golf industry show at Harrogate International Centre (HIC). 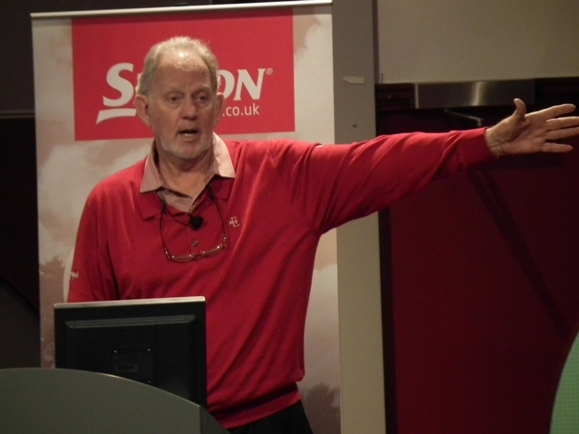 The sport’s foremost authority on the short game, Dave Pelz, headlined The Golf Show 2014 finale – a sell-out Teaching and Coaching Conference which runs alongside the exhibition. Pelz quit his job with the American space agency in 1976 to concentrate on turning his scientific expertise to golf putting and the short game. Now in its fifth year, the show welcomed hundreds of PGA professionals for a programme of educational seminars, networking, and a first look at next year’s products and services at an exhibition of more than 60 industry-leading brands. Exhibitor Stephanie Zinser, managing partner at Lynx Golf, said: “We know The Golf Show to be the strongest of its kind in Europe and wanted to come and meet PGA professionals and showcase our product. “Business at the event has been phenomenal and feedback over the three days has been hugely positive, putting Lynx Golf on an excellent trajectory going into next year. HIC director, Simon Kent said: “I am hearing lots of great things from exhibitors following the Golf Show. “I know one company saw sales up 50 per cent on last year while another spoke of expanding their customer base by 25 per cent.